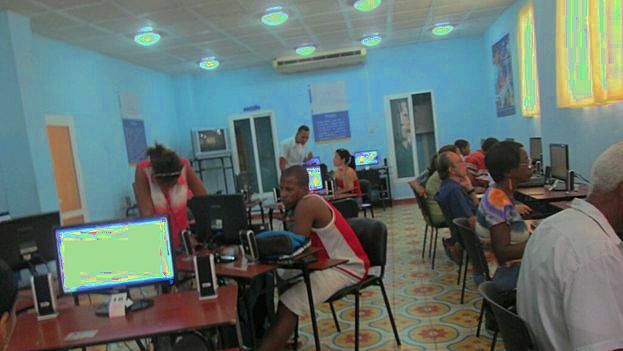 The Internet in Cuba: Cuba's WiFi access plan raises intresting questions. Cuba's WiFi access plan raises intresting questions. Do we see the outline of a future national fiber backbone? Luis Manuel Díaz Naranjo, ETECSA Director of Communications, has announced that during the coming weeks, they plan to roll out 35 WiFi access points. As shown here, they will be distributed throughout the island. Forthcoming WiFi access locations -- hint of a backbone? Mr. Díaz said the access points would accommodate 50-100 or more simultaneous users at speeds up to "1MB" per second. (I assume he means megabit, not megabyte). He also announced that ETECSA's hourly access charge would be permanently cut to 2 CUC. This is evidently a rollout of an earlier trial in Santiago de Cuba. While these access points are not yet operating, Carlos Alberto Pérez has spotted the equipment at one of the Havana locations. The equipment is supplied by the Chinese company Huawei, which is bad news for US companies. That is all I know about this new Cuban path to the Internet, but it raises several interesting questions and points. For a start, how do they achieve backhaul speeds to support 50-100 simultaneous users at up to 1 mb/s at an access point? The announcement makes it clear that some access points will be more powerful than others. Assuming they allow international access, are some linked to the undersea cable and others linked to satellites? Regardless of the international link, how is the link made from the access point to the international connection -- fiber, copper, wireless, a combination? The answer will differ for each access point. Looking back at the above map, do we see the outline of a future national fiber backbone? I have seen a couple of presentation slides showing a four-phase "planned" fiber backbone connecting many of the provinces shown on the access-point map. Eight of them are included in the first phase of the backbone. Another question has to do with the equipment vendor, Huawei. Lina Pedraza Rodríguez, Cuban Minister of Finance and Prices, said that Cuba is in "very advanced" negotiations with Huawei, at the recent World Economic Forum on Latin America. Could she have been referring to the wireless and backhaul equipment for these access points? Might she have been thinking of a possible upgrade to DSL of Cuba's telephone central offices, as suggested by the announced plan to make low-speed broadband connectivity available to half of the homes in Cuba by 2020? Or could she have been thinking of the plan to connect all Cuban schools or even a national fiber backbone like the one in the slides I saw? Regardless, one wonders how the work will be financed, what sort of concessions ETECSA has made, and what this means for US telecommunication equipment and service providers who hope to do business in Cuba. I assume the installation is being done by ETECSA employees -- I hope they are hiring some of the folks who have been building out unauthorized WiFi LANS. Will the government block access to some sites and services? Freedom House ranks the Cuban Internet as not free for political and cultural reasons, but there is also the possibility of blocking access for economic reasons. For example Skype and FaceTime are blocked in Cuba. Could that be to protect ETECSA phone call revenue? Skype recommends 100 kb/s upload and download speed with reasonable latency. 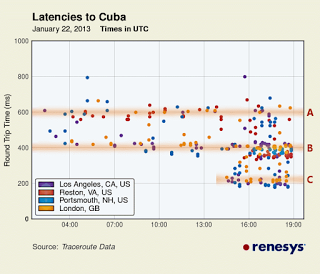 As Doug Madory has shown, Cuban undersea cable links have a latency of around 200 milliseconds, so Skype would work for international calls from cable-connected access points. Other developing nations have faced this same tradeoff. My favorite example was India during the mid 1990s when voice calls over the Internet were explicitly illegal, yet shops offering the service advertised in the newspaper and had signs on their storefronts. This is a major rollout by Cuban standards, but it is a drop in the bucket. Does it signify a policy shift? The overriding question has to do with the goal of the Cuban government. Is the goal to remain in power, maximize ETECSA profit, maximize government profit, transfer wealth to ETECSA investors, etc. or is it to provide affordable, modern Internet connectivity to the Cuban people? The WiFi hotspot in Santiago de Cuba is on line and this report makes it sound like the connection is quite slow and congested at peak hours -- whether hard wired or by WiFi. That is a bad sign -- if Santiago is not connected to the undersea cable, which region is? The photo of three Huawei WiFi antennae shown above is from the blog of Carlos Alberto Pérez, but his blog is no longer accessible online. On June 23, Pérez published a leaked document -- a presentation on ETECSA's plan for home Internet connectivity. ETECSA has denied the validity of the leaked document, saying it was used for training. They said the tentative prices shown were incorrect, but did not retract the substance of the presentation, which shows plans to provide DSL service to some Cuban homes using Chinese equipment. It seems likely that Pérez' blog was blocked because he published the leaked document. The new WiFi hotspots are now online. If you have used one, let me know what the speed and user experience was like.